David Victor is a professor of political science at UCSD’s School of International Relations and Pacific Studies specializing in international environmental regulations. Dr. Victor’s latest book, Global Warming Gridlock: Creating More Effective Strategies for Protecting the Planet, argues that international attempts to regulate greenhouse gases in large negotiating bodies like the UN are unlikely to succeed and efforts to abate global emissions should be shifted towards more practical regional and local agreements. 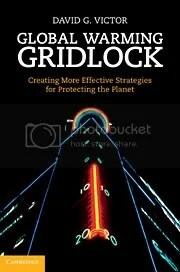 Prospect: What motivated you to write Global Warming Gridlock? Dr. Victor: I have followed the climate issue for nearly three decades. I wrote this book because the diplomatic community has been working seriously on the climate problem for 21 years and, so far, made almost no progress. I wanted to understand why diplomacy has failed so badly, where it might had made progress, and find ways to do better. Prospect: In Global Warming Gridlock, you argue that efforts to negotiate successful international agreements to limit greenhouse gas emissions have failed because of unrealistic expectations about countries’ actual willingness to abate emissions. Why is this the case? Dr. Victor: Most environmental diplomacy creates strong incentives for governments to pretend they are doing a lot. Global warming is no different. Over the last two decades governments have focused much energy on setting ambitious goals—such as stopping warming at 2 degrees—but not much real effort on achieving those goals. There are lots of reasons that diplomacy hasn’t made much serious progress, but one reason is that a lot of energy has focused on nice-sounding goals rather than practical action. Prospect: What could be done to make these negotiations more successful? Dr. Victor: The book outlines a full plan, but one place to start is to work in smaller groups rather than the UN system, which spans all nations. Only a dozen countries really matter on climate—they account for 75% of all emissions. Just getting those dozen to coordinate serious actions will be hard enough. Getting them to do that with more than 150 others sniping at the margins—as happened in Copenhagen—makes the task of cooperation harder. Prospect: Are you optimistic about future efforts to combat climate change? Dr. Victor: Over the next couple decades I am pessimistic. There are signs that some of the arguments I am making in the book are being implemented in practice—not just because I am making them but more generally because earlier efforts have failed so much that people are looking for new solutions. Nonetheless, a serious effort working, initially, with the big polluters will take a long time to organize and implement. Meanwhile, warming emissions will rise. Over the long term I am a lot more optimistic—mainly because some credible action on emissions now will spur more innovation in low emission technologies. Almost all environmental problems get solved through technological change. Prospect: What contributions do you see political science making to climate change mitigation efforts? What influence do you feel academic political science research has on policymakers? Dr. Victor: Almost all the really hard policy issues are rooted in the topics that political scientists study. The science and engineering surrounding climate change are important, to be sure, but they are relatively straightforward when compared with the politics. Politically, this is one of the hardest challenges on the planet. It requires countries with different interests to spend large resources now to control emissions with benefits that are uncertain and which arise mainly in the future. Societies generally aren’t good at doing that. I don’t think the political science community has been properly engaged in this debate, which is a pity because we have learned a lot by studying other areas of international cooperation that can help guide the proper policies on the design of international institutions to address climate change. Prospect: Many of your previous books focused on the intersection between international regulation and environmental and energy policy. Why do you find this field interesting? Dr. Victor: In the 1990s many policy analysts took a turn toward “the market.” We saw markets as institutions that would solve many of our problems. I am a huge fan of markets, but the politics of setting up markets are often prohibitively difficulty—especially in environmental issues where one of the goals of a market strategy is to make pollution more expensive. Political forces usually lead governments to choose regulatory systems rather than markets. And many of the toughest of those problems are international and relate to the energy industry. Prospect: What attracted you to academia, and did you consider any other careers before becoming a professor? Dr. Victor: I have looked at a variety of careers, but academia has tremendous intellectual freedoms that, if not squandered, make it possible to pursue lots of diverse ideas. I have been blessed in that people have let me have an unusual academic career in that much of what I do is linked to practical policy issues and to issues related to business strategy. I like spending time with companies because it gives you a feel for what real investors—who are risking real money—are thinking about today’s most pressing policy issues. The investor perspective forces a focus on reality. Prospect: What advice would you give to students interested in pursing academic careers? Dr. Victor: Academic careers require a PhD and they require a record of publication and service in the discipline. While there is a lot of talk these days about interdisciplinary work—and a role for that, to be sure—the disciplines rule on campus. Young scholars should focus on making a name in their discipline and avoid too many distractions. Prospect: Your writing has been noted for its style and accessibility, qualities sometimes rare in academic writing. What is your writing process, and what advice would you give to aspiring writers? Dr. Victor: I had a few mentors in graduate school who were good writers and who took the time to edit my work. That made a huge difference because it let me see how I could shorten and focus my writing. I also write a lot of opeds and short articles for policy and popular media, which offers me a chance to test out new ideas. The oped format is tremendously helpful because it’s just 800 words long. If you can’t convey your basic message in 800 words then you probably don’t really know what you are talking about. My main advice to young writers is to let someone who is a good writer edit your stuff and then to edit your stuff yourself. In my small seminars I require a lot of writing, and at least once a quarter I line edit a portion of each student’s essay to help them see how they can write better. My field of research is plagued by articles and books that are too long for what they need to say. Shorter is almost always better. One of the most experienced of blogs I have found! But, just perhaps there are ‘other’ resons international attempts to regulate greenhouse gases have not really gone anywhere.